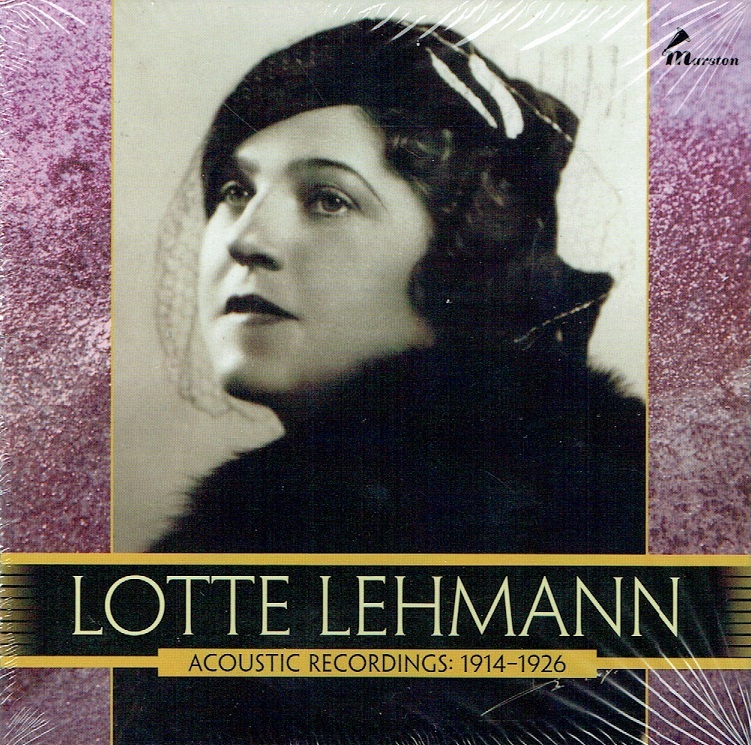 "Lotte Lehmann enjoyed a forty-year career spanning 1910 to 1950 on stage in opera and on the concert platform. Remembered now primarily for her portrayals of Wagner and Strauss roles and as a consummate interpreter of German lieder, her early recordings, not widely known, give us a broader picture of this great artist. It will, perhaps, not come as a surprise to hear Lehmann in her now familiar roles: Sieglinde, Elsa, Eva, and the Marschallin. What really makes these records outstanding is the ease and beauty of Lehmann's vocal production, and the opportunity of hearing her in repertoire not associated with her. We are treated to a generous sprinkling of Mozart, including three duets with baritone Heinrich Schlusnus, as well as arias by Weber, Lortzing, and Nicolai. Although she sings in German, you can hear French opera arias from LA JUIVE, FAUST, MIGNON, CARMEN, LES CONTES D’ HOFFMANN and MANON. From Italian opera, we hear the Willow Song from OTELLO and Puccini arias from MANON LESCAUT, LA BOHÈME, TOSCA, BUTTERFLY, and two rare recordings from SUOR ANGELICA. Other highlights include Lehmann's recording of Tatyana's Letter Scene from EUGEN ONÉGIN, an aria from d'Albert's DIE TOTEN AUGEN, and the exquisite aria and duet from Korngold's DIE TOTE STADT with tenor Richard Tauber. These are among the greatest treasures of the acoustic recording era. 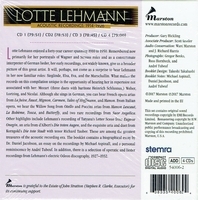 The booklet contains a biographical essay by Dr. Daniel Jacobson, Professor of Music at Western Michigan University, an essay on the recordings by Michael Aspinall, and a personal reminiscence by André Tubeuf, who has also provided numerous rare and lovely photos from Lehmann’s early career prior to her emergence onto the international operatic scene. Since there is some extra space at the end of the fourth CD, we are offering a selection of operatic and lieder recordings from her electric Odeon discography, 1927-1932." “’If she had been born in Texas they would have called her a gusher, so impulsively did she pour out her voice in an exuberant, generous flood’. 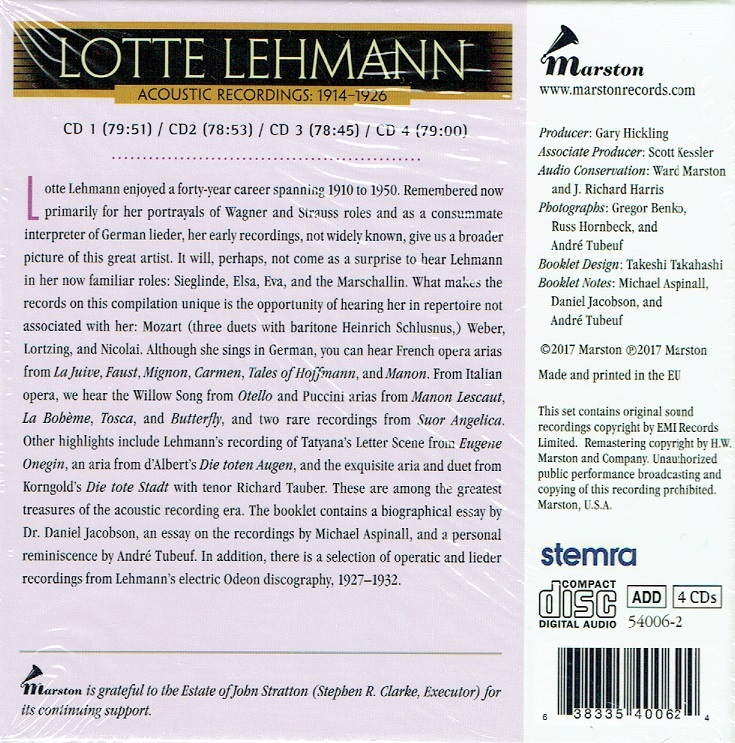 The opening words of recording producer Walter Legge's appreciation go a long way toward explaining the Lotte Lehmann phenomenon. Richard Strauss wrote three roles with her extraordinary voice and personality in mind and she sang the premieres, gathering still more fans into the orbit of her art. While opera was the primary outlet for her talents, she made many magnificent lieder appearances, notably in the decade before her 1951 retirement. A number of favorite songs made their way to disc. Lehmann was a Prussian by birth, but she captured the Viennese and gave of herself unreservedly as though she had been born one of them. A self-assured individual, she nonetheless had her battles with colleagues (especially those who sang the same roles as she) and occasionally found herself the victim of unfortunate timing. Her recordings still sell in significant numbers years after they were made. Lehmann's father was a town government official who intended that his daughter have a thorough education, one which would prepare her for a career in teaching. Instead, in a high school in Berlin where the family had moved, she applied her unmistakable intelligence to the writing of poetry (an interest that remained her entire life) rather than being conscientious about her studies. This independence would manifest itself throughout her career. Having sung from childhood, Lehmann was enthusiastic when a neighbor made possible an audition which led to vocal study at the Royal Academy of Music. Upon finishing there, she became a private pupil of Mathilde Malinger, who devoted herself to preparing Lehmann for a serious career. A three-year contract at the Hamburg Opera began inauspiciously, with small parts and tepid notices. Then, when conductor Otto Klemperer had to find a replacement for the role of Elsa in LOHENGRIN, Lehmann was asked to attempt the part. A period of intensive study brought her a triumph on opening night. Lost in Elsa's character, she gave the first of countless performances both vocally thrilling and dramatically absorbing. Quickly, other roles, including those in the French and Italian repertories, were assigned to her and, when an official from the Vienna Court Opera heard her one evening, she was engaged for that theater. In Vienna, she achieved her highest measure of fame, steadily undertaking all the great roles that would be associated with her: Sieglinde, Leonore in FIDELIO, and the Marschallin. Strauss selected her to create the Composer in ARIADNE AUF NAXOS, the Dyer's Wife in DIE FRAU OHNE SCHATTEN, and Christine in INTERMEZZO. She made a début in 1924 at Covent Garden, performed between 1928 and 1934 at Paris, and joined the Chicago Opera in 1930. Her Metropolitan Opera début in 1934 as Sieglinde drew a ten-minute ovation at her first curtain call.